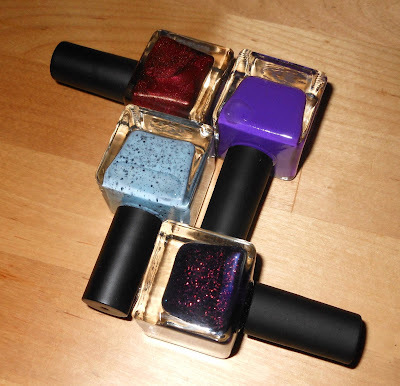 Imperfectly Painted: Urban Outfitters Polish Giveaway! *All giveaway items were purchased by me. This is not sponsored. It's been a long time since I have a had a giveaway, so I have something special for you all today! I want to thank all of who have supported me and this blog. I really appreciate all of your kindness, comments, and your support. I went to Urban Outfitters yesterday and bought some of my favorite colors of theirs for you! -This giveaway is for USA residents only. Please do not take this personally. This is to avoid any issues with customs. International entrants will be disqualified from winning the prize. -Giveaway runs until Saturday July, 6th @ 12am EDT. - One winner will be chosen. This winner will have 48 hours to claim their prize (I will send you an email) or else another winner will be chosen. -The only requirement to enter is that you provide your email. There are other optional entries, but email is mandatory. -Enter using the Rafflecopter widget below only. a Rafflecopter giveaway Happy Tuesday! Bohemian Summer is my fave! I'll be skipping entering this one since I have that and Mystic already! Good luck to everyone!!!!! Thank you for the giveaway! I just saw the Bacon Sunrise polish a few days ago and despite the funny name, it is actually very pretty. Hi dear, I will enter though I am international, but I can provide a US shipping address ^^. Thanks for the giveaway! I dont live in the US but i have an US mailing adress, can i enter? Thanks for hosting this, and I just wanted to let you know that there is a way you can check if someone is following through bloglovin. If they give you their username, you can look at their profile and see what blogs they are following, so you can make sure yours is on their list! I don't know if there's an easier way since I don't have a blog myself so I only use bl as a follower, but there's at least that! Woo, thanks for the giveaway! 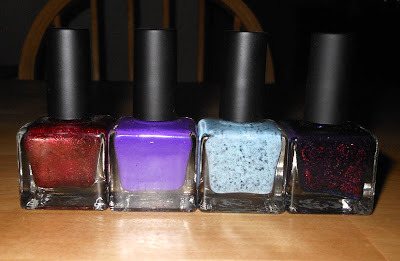 Crossing my fingers as these are all great polishes!